I'm happy too, but not because I'm a Toshiba hater, or technology lover. Hopefully, the DVD industry can move forward without any devisive wars draining resources from their efforts. I hope that translates to better products, because the last generation DVD's were functional at extremely restricted levels. Inoperability was not available possible of the time. The Orient is not known for its software prowess - I hope they put more effort than minimal effort into Blu-ray software and firmware. I hope they solve inoperability problems. What does this mean for us common folks? Replace the old DVD player? Do Blu-ray players also play audio CD/DVD's? What happens to our stock of blank CD's for burning? - or blank DVD +/- disks? Burners? - And anything else relative to everyday use? you can buy a Stand-along Blue-ray player or a PS3 ( Playstation 3 ) if you want to have the capability to play HD movies or still play Standard DVD's that are up convertered. I would recommend buying a PS3 because it is the only Blu-ray player that can be easily upgraded to take advantage of future firmware upgrades which will come out later this year. 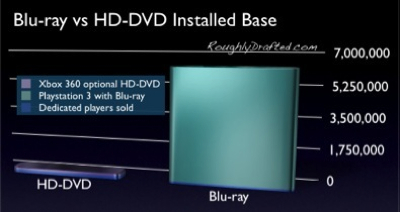 I don't know this as a fact but I thought some of Apple software did something for HD-DVD's but not Blu-ray. Even as Apple was in the Blu-ray camp. Apple DVD Studio Pro allows authoring of HD-DVDs, but doesn't actually allow you to burn them. So the feature was pretty useless and is more so now. Blu-ray players will not only play your existing DVD's etc, but they will also up-convert your standard def DVDs to look better on your HDTV. There is no hurry, but if you were in the market for a new player anyway I would start looking at Blu-ray. As far as looking, the best thing going right now is a Sony Playstation 3. it's firmware upgradeable, has plenty of horsepower, and one can play games if one wants; it's basically a computer! Paramount last studio to adopt Blu-ray..
About time they make the announcement. Paramount and Universal will now sell more movies than ever with the Blu-ray format. I wonder how long it will take for them to ship their first blu-ray disk ? Some leftover details still unresolved from the HD disk war. I know the HD-DVD is now finished, but Costco are selling them at $79.99, with 2 free movies in the box & 5 free after mail-in. As I needed a new DVD player & it about the same cost, I went and got one. This might be a reason there's no Blu-ray in the latest laptops (doesn't explain the Mac Pro/iMacs though). I hadn't considered battery life to be a factor. So I guess that would be a reason for now. But like you said, it doesn't explain the lack of Blu-ray support in desktop Macs.